"Getting up at 7 a.m. and then I start brooding"
Oscar B. Jansen, you made seven murals in the Singelhuis. How did you get the commission? "Just before I graduated in 2000 I signed up to paint a mural in Maarten Regouin's office, the head of the Faculty of Arts. I got the commission together with Cilly van Hameren. It was my first real commision. I have made another six murals in other offices and at the reception desk." Can you make a living out of art? "You wont't exactly make a fortune. I receive a special artists'benefit. Last year I made a reasonable living. My work does not sell easily. It's rather taut, not for the masses. The average artist can't get by. 96 percent needs a job on the side. For most artists it's very hard. The costs of materials are high. But I can be satisfied with littlemoney. I invest in the present, so that I can reap the benefits in the future." "From lots of things. I cab be deeply moved by a shadow on a wall. Or a fantastic house with beautifull lines. 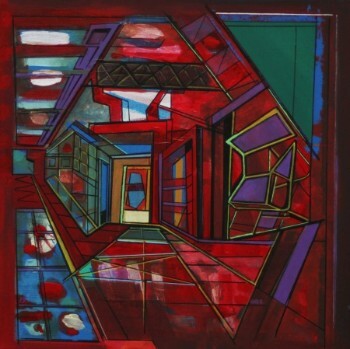 I get my ideas and themes from architecture and the city." Can you describe an ordinary working day? "I rise at 7 a.m. and strat brodding. Andthen paint. I allways work towards something. Next year you might have a new exhibition is what I think. You only learn this after a couple of years. You have to keep going ; it's the survival of the fittest. And to learn to sell your work in a professional way. Top quality and a good sales pitch, thats what it is about. You are both contractor and employee. Making deals and exchange: a friend builts a website for me and I make him a painting. I'm a member of the artists'circle called De Ploeg ( The Plough) , the artists ' collective of Groningen. For our 85th anniversary we have organised exhibitions in the art galleries Pictura and the Permanent , both in Groningen"
"I would like to become a painter at the Hanzehogeschool"
Any tips for starting artists? "Don't make any concessions. Pursue yor own style. If you have a drive , you can get far. You have to keep pushing yourself and put yourself in the spotlights. First in your own small circle, involve your family , your friends , your acquintances. Then private persons and visit galleries showing your portfolio. And then the rest of the Netherlands." From: de Hanze , 2 Oct. 2003. He talks passionately about his work and motivations. He explains proudly that last year he sold two paintings to construction company Ballast Nedam Bouwborg Ltd. A director of the construction giant had seen the paintings at the Ann's Art art gallery. Not much later the company commisioned Jansen to produce 150 full-colour silk screens on balsa wood, wich were handed out as promotional gifts. Over a five-year period he estimates to have made at least 500 silk -creens. Apart from this, his productivity becomes apparent from the approximately one hundred acrylic paintings he had made. A number those originated from a collage of photos. More over , the workaholic uses nitric acid on marble. 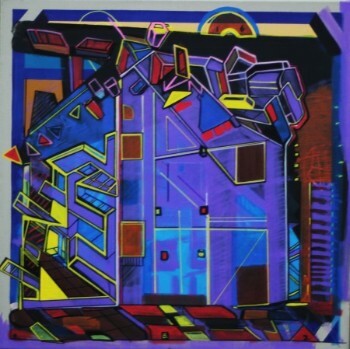 Apart from two-dimensional paintings, Jansen also concentrates on three-dimensional objects to be hung on walls , like boxes that have painted sides. "Thus the painting itself becomes an object and a form of arcitecture," Jansen explains. 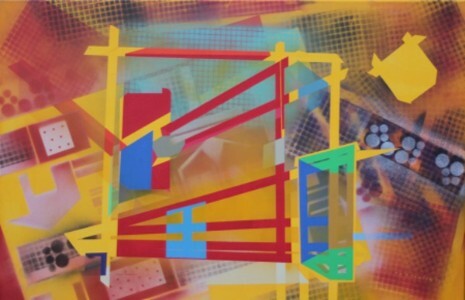 As a painter he is inspired by constructed reality with its central theme of the city. Jansen : "The city is the foundation of external / outside design; it's an immense chaos. Within an urban space you encounter many shapes and outlines. A great many of them is suitable to be used in my paintings. They are reactions to the reality of elements of city buildings or parts of them , and all this seen through teh eyes of an artist who views things emotionaly , excitedly , at times movingly or enthusiasicaly , or angrily. 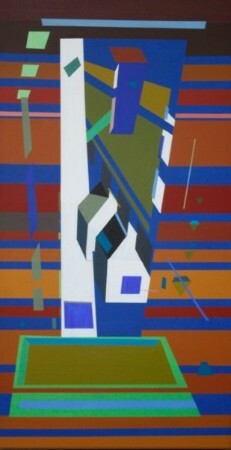 Because urban architecture is the central theme in his work , it cannot be described as abstract. For his own work Oscar B. Jansensticks to hypermodern architecture. "Not everything is beautifull, but occasionaly you can make something you do not particularly like yourself. That can be very educational, "the artist states. "In my paintings I strive to suggest illusions: I do not provide titles because the the viewer will be blocked in viewing the painting or box. I love to disorient people : I want to let them think about what is going on in a painting. I frequently use the box form because it pre-emintly suits the subjects I use. 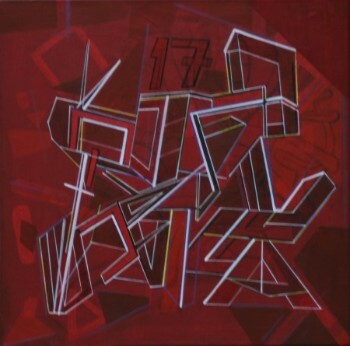 Thus , the painting itself becomes an object , a form of arcitecture. " The use of colour stands out in his work. "My vision of colour is one of my strong characteristics. I know what I can do with it as far as expression, emotions and feelings are concerned. Red has a different instincive quality than purple or burgundy. Most fun is to mix colours, to give something it's own distinctive colour. It depends on how I feel at that moment. When I feel down, I make a painting with dark colours. When I feel good, I use intense colours. Jansen wants to develop into an esteemd artist who we will remember. " I want people to appreciate what I make and to think it's good. Wow, what an incredible painting! Money is needed to support yourself, but as an artist I want to achieve something. I don't want to become a country painter. I want to make the books, so that my paintings will keep circulating. In my mind they will allways excist. " His drive is to work with his hands . "Because I have a lot of inspiration, I have a lot of energy and I enjoy to be busy. Lately I have been arranging and organising quit a bit. You could paint constantly as some kind of hermit, but then nothing happens. "Oscar B. Jansen ends with his life motto: "Free your mind and the rest will follow. If I ever become financialy independent, then I'll buy a nice studio with all kinds of metaerial and a silk-screen printing machine, and the I can make whatever I want." From : Bijtijds. Lifestylemagazine van het Noorden. Vol. 4, No. 4 . 1991-1993 L.M.O. detailhandel aan de W.G. Baarda College te Sneek. 1995-2000 Academie Minerva te Groningen. 1992-1992 Zanstra SportMontage medewerker , Manusje van alles. 2010-2011 Verkoper / Adviseur van Sanitaire produkten.